Learn how to claim your copy today! Can one book completely change your life as an investor? The answer is YES – and I want to send you a FREE copy right now. Author William N. Thorndike Jr. is the founder of a $2 billion private equity firm. And his book is the result of a massive 10-year research project with Harvard Business School. The goal was simple: to discover what separates good CEOs…from the very best CEOs. 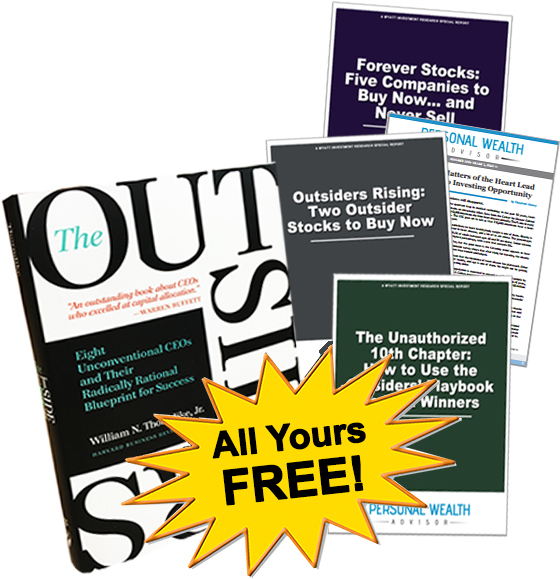 The research is groundbreaking…revealing simple secrets that have created massive wealth for a small group of investors. Now this book costs $30. But today I want to rush you a FREE copy. Because I’m 100% confident that the 272-page investing book will completely change your investment strategy…And help you discover the biggest profit opportunities. Nor are they familiar with the biggest wealth building strategy of the last century. Because the truth is that The Outsiders life-changing lessons are meant for everyone…whether you’re a seasoned investor or just starting your journey. But make no mistake: The Outsiders will challenge everything you think you know about successful investing. Inside you’ll discover how and why an elite group of companies outshined Wall Street’s favorites by leaps and bounds. Needless to say, the insights in this book could make you very rich. But I must warn you: some of what you’ll learn will upend deeply ingrained conventional wisdom. For example: Who would you say was the greatest CEO of the last 50 years? If you were like most investors, you’d answer with Jack Welch of General Electric (GE). After all, from 1981 to 2001 Welch delivered shareholders with a 20.9% compound annual return. 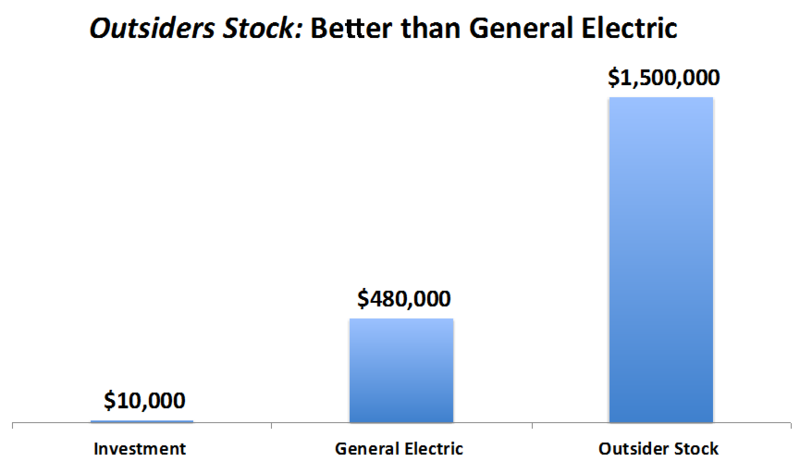 Your GE stock would have grown in value $480,000 by the time he retired. No wonder Jack Welch has become the gold standard by which CEOs are measured. But the question remains: Is Jack Welch really the greatest CEO of the last 50 years? Sure, you would have become very rich investing with Welch. But it’s nothing compared to what you could have earned by investing in a select group of stocks. Imagine watching it turn into $1.5 million. The difference is remarkable…and it has everything to do with the CEO at the helm. That’s because a small group of CEOs – known as The Outsiders – took a completely different approach…and created a profit windfall for their investors. Now, these CEOs are completely different than 99% of executives. Well, unlike Jack Welch, you’ll never see these CEOs on the cover of business magazines…on CNBC…or at popular investing conferences. So unusual are their methods that they often take Wall Street by surprise…and generate a fair amount of confusion among analysts in the process. They don’t make big speeches or have teams of advisors. They aren’t charismatic and they don’t court Wall Street analysts. But the one thing they all do very well is put shareholders first – before employees, before customers, even before themselves. The result: market-beating returns that crush the S&P 500 by more than 20-to-1. It almost sounds too good to be true. But I assure you that it is 100% possible. Keep in mind that none of these CEOs or their companies were in exciting “growth” industries. So how did these 8 CEOs create such enormous wealth for shareholders? 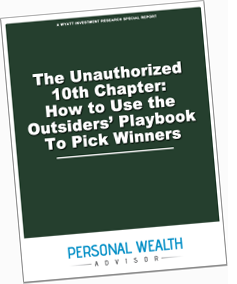 They did it by following what I call The Outsiders’ Playbook – a counterintuitive method for bucking Wall Street wisdom and making shareholders extremely wealthy. This method is often expressed in unusual financial metrics distinctly different from industry and Wall Street conventions. And its approach is shaped by the values of frugality, humility, independence, and caution…along with a dash of boldness. As you can imagine, these kinds of qualities are quite rare on Wall Street. 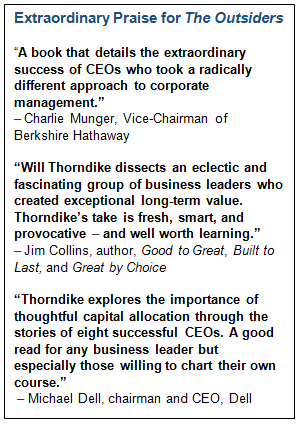 Thorndike’s book – The Outsiders – is all about 8 CEOs who delivered massive profits for their shareholders. Using this same approach, I’ve identified two amazing CEOs who are following the exact same Outsiders’ Playbook. Their actions today are creating value…and delivering big returns to their shareholders…Making now the perfect time to buy these two outsider stocks. Needless to say, I fully expect their shareholders could reap substantial gains in the near future. Soon I’ll tell you more about the CEOs and their companies. But first, allow me to introduce myself. I’m Ian Wyatt, the founder and chief financial strategist here at Wyatt Investment Research. We’re a small, independent investment research firm with 450,000 readers across the world. Located in Vermont, we’re far away from the hype on Wall Street or corruption in Washington DC. My goal is to help level the playing field for every investor…including you. And that’s exactly why I want to send you your free copy of The Outsiders. Inside, you’ll discover how a small group of CEOs made their shareholders a fortune. Fiercely independent, these CEOs ignored the noise and echo chamber of Wall Street, disdained using advisors and ran lean, highly decentralized operations. And unlike most publicly traded companies, they avoided chasing the holy grail of reported earnings…instead focusing on making shareholders rich. In the 1960s it was a small regional broadcaster with just five TV stations and four radio stations. Giants like CBS dominated the land. Then, in 1966 a man named Tom Murphy became CEO and immediately began implementing concepts of The Outsiders’ Playbook. 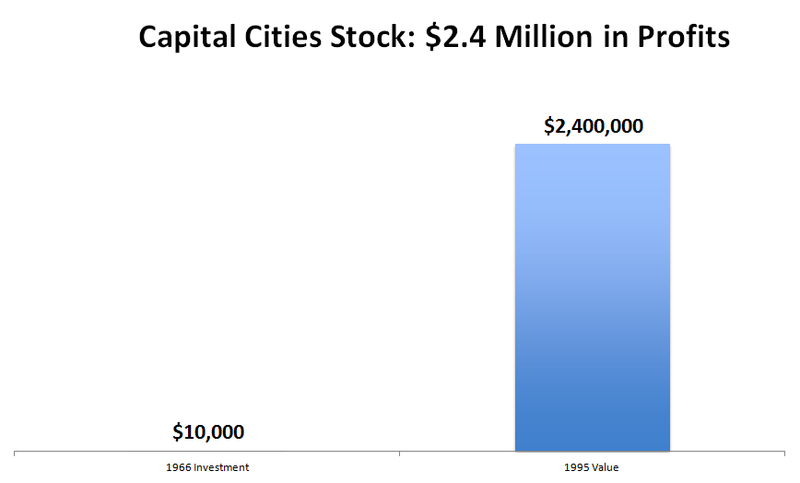 It wasn’t long before Capital Cities started growing…and growing…and growing. By 1984 it was so big it swallowed ABC – the largest industry transaction in business at the time. By the time Murphy sold Capital Cities to Disney in 1995, the company had become three times as valuable as CBS. Thanks to Murphy’s consistent use of the The Outsiders’ Playbook, $10,000 invested at the beginning of his tenure would have mushroomed into $2,400,000 by 1995. 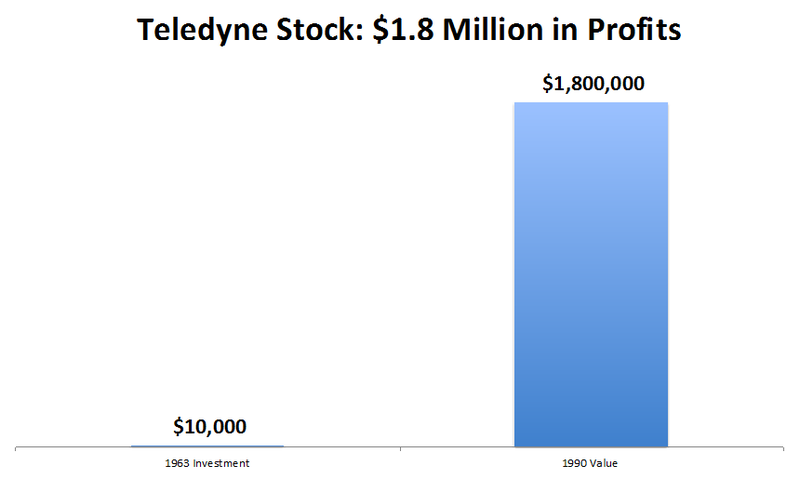 Like Tom Murphy, Teledyne CEO Henry Singleton avoided Wall Street analysts and corporate hierarchy. Using the The Outsiders’ Playbook, he also refused to provide quarterly earnings guidance or attend industry conferences. But that’s okay – because as you’ll see, he was a pioneer in his industry in more ways than one. From 1963 to 1990, every $10,000 mushroomed into $1,800,940. Keep in mind, both of these CEOs made these enormous fortunes for their shareholders by doing a few key things their rivals weren’t – all of which you’ll discover inside The Outsiders. When the Cold War came to a close, the defense industry was in trouble, with an index of the leading publicly-held firms falling 40%. General Dynamics was one of them. As Goldman Sachs said at the time, it was the “lowest of the low” in a declining industry. That all changed when Bill Anders – a former lunar module pilot – took the helm. When he did, he was startled by how little concern there was for shareholders – and immediately began using The Outsiders’ Playbook to correct this. In less than three years, Anders made a series of dramatic moves that stunned Wall Street and sent its stock price soaring so high even Warren Buffett started to take notice. 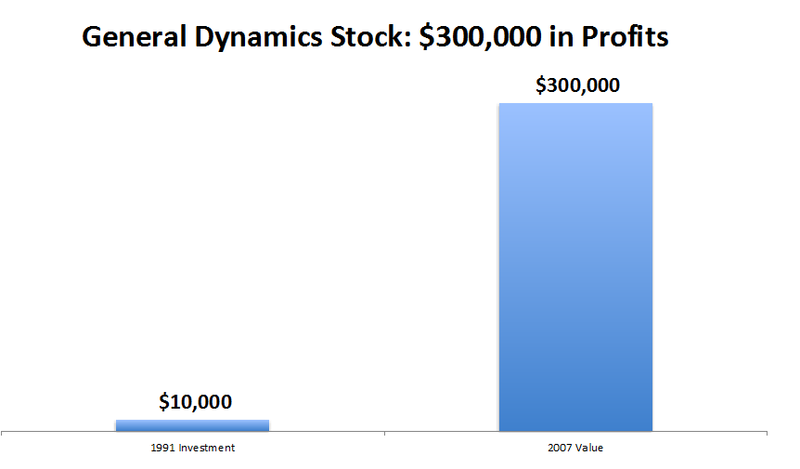 Thanks to Anders’s unconventional leadership, General Dynamics grew at a compounded annual rate of 23.3%, enough to turn every $10,000 into $300,000. Like the outsiders above, Bill Stiritz never issued quarterly guidance and rarely spoke to analysts or attended industry conferences. Upon becoming CEO of the packaged foods giant in 1981, Stiritz made a series of bold moves from The Outsiders’ Playbook. These quickly put Wall Street on notice that he would be taking the company in a radically different direction. Not only that, he was alone among CEOs in his industry in doing two things he was convinced would generate significant returns for his shareholders. 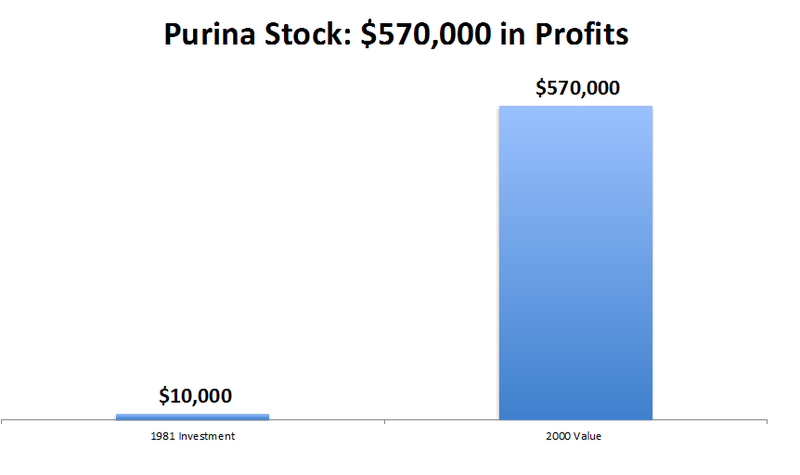 Over his 19 years a CEO of Ralston Purina, investors reaped a compounded 20% return – turning every $10,000 into $570,000. There are four more stories – and lessons – of blockbuster financial success waiting for you in The Outsiders: Eight Unconventional CEOs and their Radically Rational Blueprint for Success. Once you understand The Outsiders’ Playbook, you won’t ever look at the companies in your portfolio the same way again. You’ll know whether or not they’re putting Wall Street first – or you. Thorndike explores one of the "mysteries" as to why some businesses... have been able create outsized shareholder returns over time. An exquisite blend of extensive research, hard data and wonderful story telling, Thorndike's The Outsiders will go down as one of the most important pieces of financial analysis ever written. Will Thorndike's book The Outsiders, should be on the must read list for all value investors. A careful reading of this book will help you better identify current CEOs who share the same mindset as the successful managers profiled in the book. I highly recommend The Outsiders by Will Thorndike for anyone interested in investing or management. It's perhaps the most valuable book I've read on these topics. And it’s why I can’t wait to rush you your free copy of this amazing book. All I ask is that you pay the small $4.95 shipping and handling fee. There’s something else I want to send you…. It’s a free special report called Outsiders Rising: Two Outsider Stocks to Buy Now (a $29.95 value). The Outsiders is an outstanding book. Unfortunately, it doesn’t actually offer ANY current stock recommendations. In fact, the outstanding examples it profiles are all from recent decades. Using this research, you can essentially “turn back the clock” and buy a stake in these stocks before they take off. Inside, you’ll get the full story on these companies closely following the Outsiders’ Playbook, move by move. The first is an extremely diversified industrial giant serving everyone from giant conglomerates to individual consumers… and without question the perfect mix of growth and stability. If you own something made of plastic or metal, you can bet this company had a hand in making it. It has proven its allegiance to shareholders time and again, with its stock appreciating 6.5xs higher than the S&P 500 over the past 30 years. And amazingly, it’s still undervalued, with the stock trading at a 19% discount to its 52-week high. But I don’t expect it to stay this way for long. The second company you’ll discover is a leading global designer and supplier of highly engineered aircraft components. With a string of acquisitions under its belt, it’s now boosting its foothold in niche markets with an arsenal of proprietary products. It’s also a shareholder’s dream come true, handing investors 760% returns over the last 9 years… and that’s not including the special dividends the company has been paying out. Make no mistake: I firmly believe the two stocks included in this special report are destined to join the ranks of the ones you’ve read about here – and make shareholders spectacularly wealthy. Finding them wasn’t easy. “Outsider stocks” are a rare breed, after all. But when I saw how closely these companies – and their CEOs – are following the Outsiders’ Playbook…I knew I had finally struck gold. And that’s why I had to share this research with you. Are the companies in your portfolio really serving you? Or are they focused on meeting the demands of Wall Street analysts? Outsider CEOs take a different approach to running their companies. And the biggest difference is that they focus 100% on creating value for shareholders. Inside this unauthorized chapter, you’ll discover how to implement the Outsider Strategies in YOUR investment portfolio. This must-have manual reveals top criteria for evaluating how closely a CEO follows The Outsiders’ Playbook. With this info by your side, you’ll be armed with the knowledge and frame-of-mind necessary for picking big winners and chucking the losers. Both of these special reports and The Outsiders: Eight Unconventional CEOs and their Radically Rational Blueprint for Success are yours, free. All you need to do is cover the small shipping and handling fee ($4.95). Keep in mind that we have a limited supply of this book on hand, so I urge you to grab your copy quickly. When you do, you’ll also be enrolled in a FREE 30-day trial subscription to Personal Wealth Advisor. Like “The Outsiders”, Personal Wealth Advisor looks far beyond superficial Wall Street analysis and hype to uncover the safest, most solid investments available. Like the book, the only metric we’re truly concerned with is whether a company puts shareholders first. All the rest is noise. With Personal Wealth Advisor, you have access to my entire team of wealth-building experts. Each wealth advisor is tasked with one goal, and one goal only – to bring their best ideas front and center – and present them to you every single month. They might not be the sexiest companies in the world…but they’re certainly some of the strongest. If years of solid, compounding growth and hefty dividends are your thing, look no further than these five pillars of stability. Each has been cranking out returns for investors for decades – some for more than 100 years. These are some of the same companies that Warren Buffett's Berkshire Hathaway owns – and I like them for the same reasons he does: they represent the best of what I call "The Investor's Ideal"... growth, stability, and income. A $19.99 value – it’s also yours 100% free. In total, you’ll immediately have access to $80 of special reports. Plus, I’ll rush you your free copy of The Outsiders. All you have to do is take care of the small $4.95 shipping and handling fee. But you must act now. Our supply of The Outsiders is going fast. And I’d expect to run out of our inventory very quickly. So I urge you to claim your free copy and your free gifts RIGHT NOW. P.S. Remember, we have a limited number of copies of The Outsiders: Eight Unconventional CEOs and their Radically Rational Blueprint for Success available for mailing. Once we’re out, we’re out. Get this life-changing book now for free while you can. Are You Sure You Don't Want a FREE Book? WAIT! Through a special arrangement, you can claim your free copy of “The Outsiders.” In total, you’ll claim $80 of FREE GIFT… and pay just $4.95 for shipping & handling. A FREE Book Sounds Great!